The second lady in Denmark in April 2000 was the Queen's mother, Queen Ingrid. She attended the theatre gala wearing the ruby parure. (Here's a timeline of that tiara's history!) 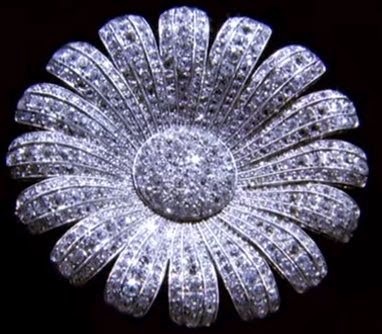 Moreover, she celebrated her daughter's birthday that year with an important present: the diamond daisy brooch. Crown Princess Mary had not yet joined the Danish royal family at the time of these celebrations -- in fact, she would meet Frederik for the first time at the Sydney Olympics a few months later. (He was away in Greenland during these festivities.) Princess Alexandra, Prince Joachim's first wife, was Margrethe's only daughter-in-law at the time. She wore the diamond drop tiara that she'd been given by Margrethe as a wedding present. Princess Benedikte wore the Sayn-Wittegenstein-Berleburg Fringe Tiara with pearls. Benedikte's elder daughter, Alexandra of Sayn-Wittgenstein-Berleburg, borrowed the Baden Palmette Tiara from her grandmother, Queen Ingrid, for the gala. Nathalie of Sayn-Wittgenstein-Berleburg, Benedikte's younger daughter, wore her mother's floral birthday tiara. Queen Anne-Marie wore the Greek emerald parure to the theatre gala. And Anne-Marie's daughter, Princess Alexia of Greece and Denmark, wore her diamond tiara, pairing it with a diamond necklace that she often wears to gala events. Queen Beatrix of the Netherlands, escorted by the Duke of Edinburgh, wore the Antique Pearl Tiara for the gala. Queen Silvia of Sweden paid tribute to Margrethe by wearing a tiara that had belonged to her grandmother, Crown Princess Margareta of Sweden. 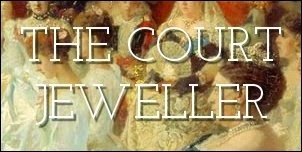 She paired the Connaught Tiara with the family's gorgeous pink topaz demi-parure. Crown Princess Victoria wore the small diamond and sapphire tiara she had received as an eighteenth-birthday present. In the background, you can see Victoria's aunt, Princess Christina, wearing the small tiara that was stolen and thrown into the sea by the thief a few years ago. No tiara yet for Princess Madeleine, who would celebrate her eighteenth birthday that June. Queen Sonja of Norway wore the full version of Queen Maud's Pearl Tiara -- or rather the recreated tiara, as this was five years after the original tiara was stolen from Garrard. Crown Prince Haakon wouldn't marry Mette-Marit until the following year, so at this gala, he escorted his sister. Princess Märtha Louise wore the tiara given to her by her grandfather, King Olav. Grand Duchess Josephine-Charlotte of Luxembourg wore the family's topaz and pearl parure at the evening gala. Her husband, Grand Duke Jean, abdicated that October.